EllaFittingRoom is a smart fitting room that works together with EllaFashion digital price tags. It helps customers to try and buy more and can be combined with efficient anti-theft features. EllaFittingRoom Solution makes the customer’s shopping experience more pleasant than ever, while it is easy to call for assistance and ask for another size, color or different garments via tablet. The system keeps continuous count of garments (i.e. EllaFashion digital price tags) arriving and leaving the smart fitting room. This is to silently notify of possible unusual behavior, like too many of the same items. The efficient anti-theft system leads to minimum shrinkage. Order different size, colour or product to Fitting Room via touch screen. The request arrives at shop assistant’s mobile. With anti-theft feature, 40% less shrinkage. When needed, a silent alarm is sent to the shop assistant’s mobile. The digital price tag also alerts like a regular anti-theft alarm at the gate besides the doors. 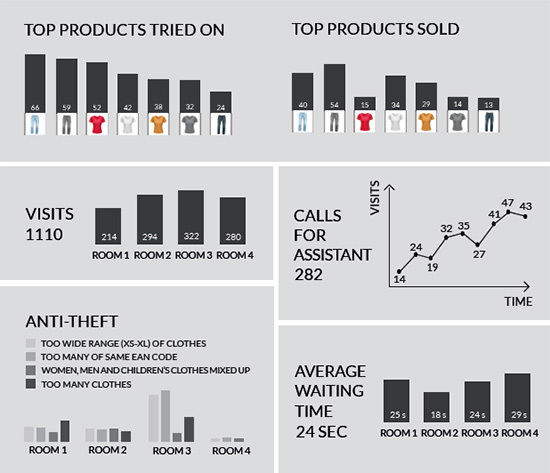 EllaFittingRoom is the most efficient retail anti-theft system leading to minimum shrinkage. EllaFashion Solution is a dynamic pricing system consisting of digital price tags, two-way radio equipment and controller software. Please contact us to make it part of your business.